December 25: UNICEF Ambassador Clay Aiken blogged today at UNICEF FieldNotes as part of UNICEF's "12 Days of UNICEF" awareness campaign. The blog, entitled Clay Aiken: Help kids in emergencies stay in school, supports UNICEF's School in a Box education kits, available through UNICEF's Inspired Gifts. Aiken, who was appointed a UNICEF Ambassador in 2004, holds a degree in special education and is a former teacher. In the spirit of this season of giving, please read the blog, then visit the Inspired Gifts: Education & Play section. Find out how, for just a few dollars, you can make a difference in the lives of the world's children by bringing them the stabilizing force of education, during emergencies and throughout the year. This morning the U.S. Fund for UNICEF announced the "12 Days of UNICEF" blogging campaign, featuring daily blogs from UNICEF Celebrity Ambassadors and Supporters discussing life-saving gift options for children around the world. 25,000 young children die every day from preventable causes—things like malnutrition, poor sanitation and lack of safe, drinkable water. 25,000 children die every day. UNICEF believes that number should be zero. Here's your chance to make a real difference. In the spirit of this season of giving, what better gift than to save a child's life for just a few dollars? New York, NY (PRWEB) December 19, 2008 -- The U.S. Fund for UNICEF announced today "12 Days of UNICEF," a blogging campaign to encourage Americans to give back this holiday season with Inspired Gifts. Beginning December 19 and running through December 31, UNICEF celebrity Ambassadors and Supporters, including Lucy Liu and Clay Aiken, will post daily blogs on the UNICEF website at FieldNotes about Inspired Gifts and their impact on children around the world. From nutrient enriched food, medicines and immunizations, to wool blankets, tents and school supplies, UNICEF's Inspired Gifts can mean a world of difference to children living in harsh circumstances due to poverty, exploitation, armed conflicts and natural disasters. Participants in the program choose an item from the collection of life-saving gifts to be shipped to children in need in one of over 150 countries and territories where UNICEF works. Recipients receive a UNICEF Acknowledgment Card identifying the item that was sent and how it will be used to save children's lives. Celebrities lending their support to the program include Clay Aiken, Lucy Liu, Joel Madden, Nicole Richie, Alyssa Milano, Marcus Samuelsson, Al Roker, Jon McLaughlin, Mia Farrow and Sarah Jessica Parker. Some of the items they will blog about include HIV test kits, bicycles, water well hand pumps, insecticide-treated mosquito nets, measles vaccines and more. For more information, visit Inspired Gifts or call 1-866-237-2224. For more than 60 years, UNICEF has been the world's leading international children's organization, working in over 150 countries to address the ongoing issues that affect why kids are dying. UNICEF provides lifesaving nutrition, clean water, education, protection and emergency response saving more young lives than any other humanitarian organization in the world. While millions of children die every year of preventable causes like dehydration, upper respiratory infections and measles, UNICEF, with the support of partnering organizations and donors alike, has the global experience, resources and reach to give children the best hope of survival. For more information about UNICEF, please visit U.S. Fund for UNICEF. 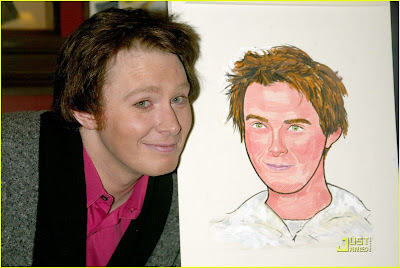 Congratulations Clay Aiken! What a delightful honor to be given your very own caricature at the world-famous Sardi's Restaurant on December 23rd. Clay's very successful run in Monty Python's Spamalot ends on January 4 and the show closes on January 11. If you haven't seen this fabulously funny show yet - get your tickets before it's too late. Discounted tickets for Spamalot are available. How fitting that Broadway performers are celebrated at Sardi's as the restaurant was the birthplace of the Tony Awards. After the death of Antoinette Perry in 1946, her partner, theatrical producer and director, Brock Pemberton, was eating lunch at Sardi's when he came up with the idea of a theater award to be given in Perry's honor. For many years Sardi’s was the location of the announcement of the Tony Award nominations. Vincent Sardi, Sr. received a special Tony Award in 1947, the first year of the awards, for "providing a transient home and comfort station for theatre folk at Sardi's for 20 years." Clay joins more than 1,300 celebrity caricatures on display. The drawings were originally done by Alex Gard, who created more than 700 caricatures for the restaurant,before he died in 1948. After Gard, John Mackey took over drawing for the restaurant but was soon replaced by Donald Bevan. Interestingly, Bevan was a playwright who co-write the wonderful play, Stalag 17. Bevan did the drawings until 1974 when he retired, and was replaced by Brooklyn-born Richard Baratz,a banknote and certificate engraver by profession. Living in Pennsylvania, Baratz continues to the present day as the Sardi’s caricaturist. The walls of the main dining room cannot display all the caricatures done over the past 80 years. (Or, actually, the copies thereof, since too many originals were stolen — from James Cagney and Streisand to Maureen Stapleton, who snatched her own and burned it.) So now, the originals go into a vault, and two copies are made. One goes to the subject of the caricature, the other up on the Sardi's wall. Clay's had quite an exciting year and on People.com he Reflects on a Year of Coming Out, Being a New Dad. Clay plans on spending his down time with his son, Parker and Parker's mother and Clay's dear friend, Jaymes Foster before getting back to singing. Have a Wonderful Holiday and a Fabulous New Year! And . . . if you have a minute - let us know what's next - there are old fans and new who are eager to hear you sing LIVE! Read on for details about this innovative awareness campaign! Breaking News: This morning the U.S. Fund for UNICEF announced the "12 Days of UNICEF" blogging campaign, featuring daily blogs from UNICEF Celebrity Ambassadors and Supporters discussing life-saving gift options for children around the world. As we near the end of the year, I find myself thinking about crossroads. The three things that I’ve thought about the most this year are Clay Aiken, the election and my own life (not necessarily in that order). The country is obviously at a huge crossroads as we face the toughest economic time in decades and all eyes on the incoming administration to find the fix, sooner rather than later. I have confidence in his abilities but it's quite a mess he's been handed. I used to check the market once or twice a day, now I check it once or twice an hour. My kids' 529 accounts are worth about $5.29. The market will come back, you say? Well, that’s all fine and dandy except we needed that money in about 9 months. Yes, I’m focusing on 529 accounts as this is a crossroads in our family too. My son is now in high school and one morning this summer, he woke up taller than I am. I’m caught in the vortex of my daughter’s senior year. In the chaos and complexity of common application, recommendations, deadlines, college tours, FAFSA and a mountain of paperwork, there is the real human emotion of preparing your child to leave you. While my daughter looks at a dorm to see how big the room is, I look and see how happy the buzz is in the hallway. How has the time flashed by so quickly that we went from “did you pick up your dolls and put them away” to “did you submit your college essay today” in what seems like 3 months. This is a crossroad that I thought I was prepared for but in reality, I’m distracting myself with researching scholarships so that I don’t notice I’m blinking back tears. But, sometimes crossroads happen when you least expect them. When your company goes from a record year to hanging on for dear life. When so many of your friends leave voluntarily or otherwise because of it. When the CEO tells you he can’t afford your position but doesn’t want to lose you so you accept a compromise that is far, far less than you are worth but leaves you with free days during the week. When preparing all the complexities of your daughter (and one of her friend’s) college applications and timelines makes you realize you’re damn good at this and maybe this could be a business. When you turn those unexpected free days into productive days and the next thing you know you’re incorporated with a business of your own ready to go in less than a month. When maybe, just maybe, this crossroad was just waiting for the right moment to take a deep breath and turn left with eyes wide open. When friends, family, your banker and even your doctor tells you they haven’t seen your eyes sparkle the way they do when you talk about your new business, you tell them they haven’t seen you before a Clay Aiken concert. Ah, Clay. This has been a crossroad year for you too. You opened up a new chapter of your career by starring in a Tony Award winning comedy-musical that showed you can act, dance and as one of your great reviews said “handle supremely silly”. You bared your soul in an album that is one of the best I’ve ever heard. Your longing for a child provided strength to be true to yourself completely for the first time in your life. You faced your crossroad in a more public way than most of us and yet it is visible to those of us that love you that the road you chose has made you free. You are defined now not only as singer, actor, entertainer, and philanthropist. You are a father. Hold him tight,Clay. Pretty soon you’ll be blinking back tears searching for scholarships too.